Isobel Campbell possibly occupies the same peculiar position that Einar did in The Sugarcubes. While Ms Campbell may not holler lobotomised gibberish or spend her time in search of pub brawls, like Einar she’s simultaneously cited as her parent band’s frustrating weakness and its very essence. With no escape here from Campbell’s barely audible whisper, this album will confirm for detractors at least, that ‘twee’ is the ultimate put down. Yet there’s also a darker and much more brooding atmosphere than is normally associated with Hello Kitty lunchboxes and flying a bright kite out in the park. ‘Partner In Crime’ and ‘There Was Magic, Then’, for instance, are magnificently windswept, recalling the baroque grandeur of Lee Hazlewood, or hinting at Ennio Morricone’s dramatic film scores. Even on more typically delicate diversions, such as ‘Fallen From Grace’, the mood is intensely sad and bewitching. Nevertheless, it’s not all wintry bleakness either. ‘Sister Woman’ is a frothy country-soul jaunt that’s probably too cute for Rancid fans, while ‘Solace For Pain’ chimes brightly with keening pop. Even though Isobel is extending her range, ‘Swansong For You’ won’t eclipse the rehearsed complaints. Nonetheless, Ms Campbell still has a good deal more charm than any of Einar Sugarcube’s shrieking moon howls. When listening to the Gentle Waves you have to wonder whether Isobel Campbell would have made records as lovely as this without the Belle and Sebastian influence. Not to underestimate her talent, but the title track does bear an uncanny resemblance to ‘The Model’ from B&S’s last LP. Somehow though, it’s better than that. Maybe it’s the almost continental-sounding vocals, lilting along over harpsichords. Or perhaps it’s the chorus that sticks in your head. Most likely it’s the fact that Campbell has a beautiful, beautiful voice, unrivalled on today’s indie scene. Effortless. 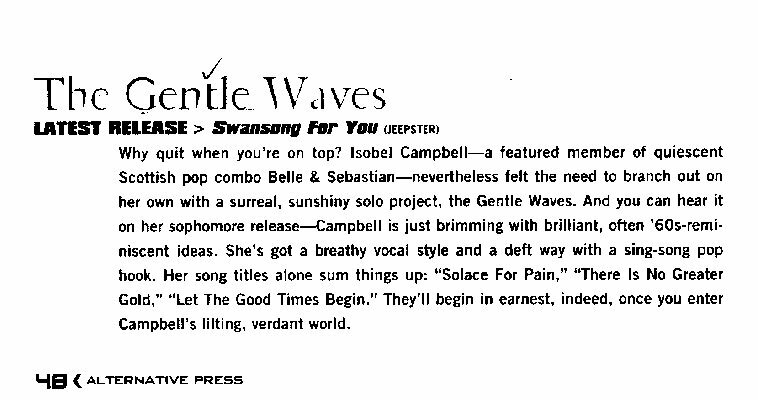 The voice of the Gentle Waves is Isobel Campbell, also of a certain Belle & Sebastian. But don’t judge this record on that basis. Really the Gentle Waves deserve more, as their debut of April 99 ‘The Green Fields of Foreverland’ was a stunning collection of songs as varied as you could hope for. And ‘Swansong For You’ is a fine sequel. Quirky anecdotes characterise fine song-writing, but with a deep channel of personal reflection and inner anxiety – which is at times totally juxtaposed with the confident and soaring vocals, backed with a sonic tapestry worthy of Scott Walker at his best. A wonderful LP and no mistake. Campbell’s album, recorded and mixed in just one week, could almost be a collection of long-lost children’s TV themes. Lyrically, it’s a little saccharine, and she hasn’t quite earned those chanteuse stripes yet. The melodies are strong, though, and in places the predominantly pastoral-sounding arrangements have a real charm. Peaks include the single Weathershow, a more raucous affair which seems to feature duelling stylophones, and Renew And Restore, a ‘cowboy song’ bolstered by some tasty country fiddle. If you fancy a break from the increasingly uniform sound of the name producer/major label combo, then this record fits the bill. In which Isobel Campbell, erstwhile cellist with Belle and Sebastian, proves she’s not just Mary Hopkin with A levels. Despite scoring high on the cuteometer, the sparse acoustic arrangements and Bacharach flourishes blend a warmth and subtlety missing on B&S’s last album. Still, less sugar and more spite would be good. NME – Give Us a Breaker!